Auto body shops wishing to buy the common 10- or 30-pound tanks of R-1234yf or R-134a refrigerant will need to have at least one air conditioning-certified technician by Jan. 1, 2018. After Jan. 1, a technician must be certified under either Clean Air Act Section 608 or Section 609 for they or their shop to buy more than two pounds of non-exempt refrigerants, according to Environmental Protection Agency requirements. Quantities 2 pounds or less must have a self-sealing valve. 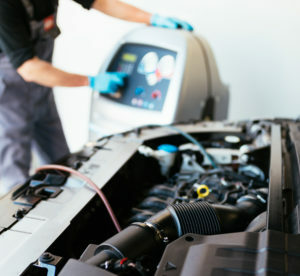 Section 609 certification, which deals specifically with automobile air conditioning and doesn’t count for stationary air conditioners, is the logical choice for a collision repair technician. The latest program includes R-1234yf training, according to the Mobile Air Conditioning Society. MACS, whose industry-first technician A/C recovering and recycling certification program was even enshrined in the Clean Air Act, will certify a technician at a cost of $20 per test and even offer classes. (The EPA offers a list of other approved training and certification programs here.) It’s Section 609-certified more than a million technicians over its history. MACS member relations and marketing Vice President Marion J. Posen said the organization had seen a “a huge uptick” in test-takers with the deadline approaching. But there’s room for you too. “We’re not ever going to reach capacity,” Posen said. MACS has stressed the relative simplicity of the Section 609 requirement to owners and technicians. Once a technician is certified under Clean Air Act Section 608 or Section 609, the credential is good for life — he or she will never have to renew it. If a technician was certified by MACS or the International Mobile Air Conditioning Association in the past and lost their credential, MACS will replace it for $10. A shop owner trying to buy refrigerant after Jan. 1 should only need their certified technician’s credential. Section 609 test and resource links can be found here. Section 609 classes or webinars: 215-631-7020 x 304 or marion@macsw.org.